The Bank for International Settlements has attributed the volatility of the price of Bitcoin and other cryptocurrencies to the lack of a crypto central bank. This column examines the implications of this and the increasing, but bounded, supply of Bitcoin for the cryptocurrency’s price. It also discusses how the price of Bitcoin interacts with monetary policy for traditional currencies. Cryptocurrencies, in particular Bitcoin, have received a large amount of attention as of late. The total market capitalisation of cryptocurrencies reached nearly $400 billion in December 2017, according to coincodex.com. 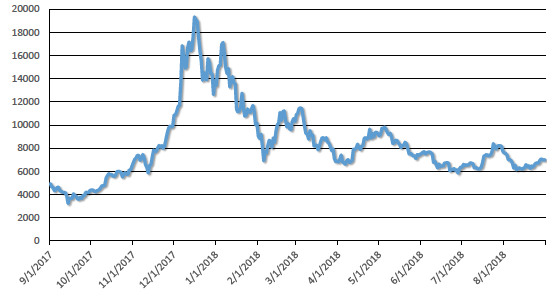 As the two figures above show, the Bitcoin price has dramatically increased during 2016 and 2018 to a peak of nearly $20,000. While it has stabilised somewhat since the beginning of 2018, its volatility is still quite substantial. These developments make it increasingly urgent to understand the valuations of cryptocurrencies. According to a Financial Times article from June 2018, the Bank for International Settlements (BIS) traces the instability of crypto-prices back to the lack of a crypto central bank. The fact that the value of Bitcoin is not controlled by a designated central bank constitutes a major difference to traditional currencies. The US Federal Reserve Bank, for instance, injects or withdraws dollars from circulation in order to meet its policy goals such as a stable rate of inflation. The supply of Bitcoin, in contrast, evolves due to decentralised computing activities of 'miners' and can only increase over time. Therefore, a traditional tool for promoting price stability is unavailable for cryptocurrencies. The BIS addresses 'unstable value' as one major challenge for cryptocurrencies for becoming major currencies in the long run. Bitcoin, like dollars, is intrinsically worthless – both are fiat currencies. The co-existence of two fiat currencies and its analysis is nothing new. If both are used as a medium of exchange in an economy, then their exchange rate is indeterminate, as Kareken and Wallace (1981) showed in a celebrated paper. With Bitcoinin particular, or cryptocurrencies more generally, new issues arise, however. In particular, the absence of a Bitcoin central bank and the increasing but bounded supply of Bitcoin introduce new and potentially important aspects. The observed random fluctuations in the Bitcoin price loom large and are absent in the Kareken-Wallace analysis. Finally, traders may look upon Bitcoin and other cryptocurrencies as an investment, speculating on their rising prices, rather than as a medium of exchange. What are the implications for Bitcoin pricing, and for the monetary policy of the traditional currency, when taking these novel aspects into consideration? Our new paper (Schilling and Uhlig 2018) provides some key results. We analyse the double role of Bitcoin (or any other cryptocurrency) as both a medium of exchange as well as an object of speculation. We envision a future world, where both dollars and Bitcoin serve as fully accepted, frictionless means of payment to buy a perishable consumption good. Crucially, we assume that both dollars and Bitcoin are intrinsically worthless. In contrast to other assets, holding either of these currencies yields neither dividends nor utility. The only use of fiat currencies is that they can be used to purchase goods. We assume that there is a central bank achieving an exogenously given stochastic inflation target for the dollar, while there is no central agency controlling the value of Bitcoin. 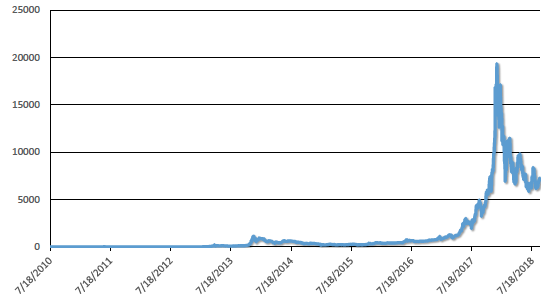 Our model permits that agents hold back Bitcoin, to speculate on its future price rise. However, we find that this will not happen in equilibrium, under reasonably mild assumptions. Instead, agents spend both all their dollars and Bitcoin in each period. The intuition for the result is an intricate tango between buyers and sellers. If the price of Bitcoin were so low today that buyers would not want to part with them to purchase goods, then goods sellers would want to hold Bitcoin too and would refuse to sell against dollars. In equilibrium, it must be the case that both sides of the trade are happy. Therefore, if dollars and Bitcoin are both used at all, then all of them will change hands at each time period, in equilibrium. This may not look like the world we currently see. Perhaps there is indeed a large number of traders out there who only hold Bitcoin in order to speculate on their appreciation. The model and this line of reasoning then serve to sharpen the intuition about when such a speculative phase must end and why. Second, we show that in expectation, tomorrow's Bitcoin price (expressed in dollars) equals today's Bitcoin price corrected by the correlation between the Bitcoin price evolution and a nominal pricing kernel, given by dollar inflation-corrected marginal consumption. Our pricing formula resembles standard consumption-based capital asset pricing model (CCAPM) results (Sharpe 1964, Lintner 1975, Cochrane 2005). This stems from the fact that both the CCAPM and our pricing equation are derived from intertemporal consumption-based models. There is a substantial difference, however. The CCAPM prices assets on the basis that agents should be marginally indifferent between consuming more today versus tomorrow in equilibrium. By contrast, our pricing equation arises from the additional indifference between using Bitcoin versus dollars for both buyers and sellers. Consequently, our pricing equation exploits intratemporal considerations and our pricing kernel can take a somewhat different form from those used in the CCAPM literature. Intuitively, the expected real return for holding Bitcoin, corrected by risk-aversion, needs to equal the real return for holding dollars. If this condition was violated, sellers would either refuse to accept one of the currencies or buyers would refuse to part with them. Our pricing formula therefore only requires that agents spend some Bitcoins as well as dollars. The pricing formula can be rewritten in terms of the correlation of the future Bitcoin price with the dollar inflation-corrected marginal consumption. If this correlation is negative, then the Bitcoin price, expressed in dollars, increases in expectation. On the other hand, under positive correlation, the Bitcoin value drops in expectation. In the special case of no correlation, for instance under risk-neutrality of agents and a constant dollar price level, the Bitcoin price is a martingale, implying that the Bitcoin price today is the best forecast of the Bitcoin price tomorrow. Again, note the difference to standard asset pricing results, where such a lack of correlation would instead imply that the asset price increases at the rate of interest. Third, we show, if the real value of Bitcoin is positively correlated with the marginal utility of consumption, then the total purchasing power of the entire Bitcoin stock vanishes over time. This result represents one important implication of Bitcoin's bounded supply. The result holds because the real Bitcoin price process is a strict supermartingale (i.e. falls in expectation), given the assumed positive correlation. Fourth, we show, that there exists an upper bound for the real Bitcoin value which depends on the maximum output the economy can produce and the current Bitcoin stock. The upper bound falls as the Bitcoin stock continues to grow. The result is interesting in that it hinges on the fact that the Bitcoin stock can never decline and thus never go to zero, a feature not satisfied by traditional fiat money. In particular, the last two results are driven by the absence of a Bitcoin central bank. The competition between Bitcoin and the dollar in our model gives rise to an inflation-dependent Bitcoin pricing formula. Therefore, Bitcoin prices interact with dollar monetary policy. We show that this has both a traditional and an unconventional implications for the dollar central bank. For the traditional implication, assume exogenous fluctuations in the Bitcoin price. The dollar central bank then needs to take these fluctuations into account in its dollar supply decisions in order to achieve its desired inflation target. For the unconventional perspective, suppose that the dollar inflation target materialises for a broad range of dollar injections. The market clearing condition then implies that the dollar central bank can steer the Bitcoin price. More possibilities can arise. Our study provides a starting point for thinking about these possibilities. Cochrane, J H (2005), Asset Pricing (Revised Edition), Princeton University Press. Financial Times (2018), “’Environmental disaster’: BIS warns on cryptocurrencies”, 18 June. Schilling, L and H Uhlig (2018), “Some Simple Bitcoin Economics”, NBER Working Paper 24483. Kareken, J and N Wallace (1981), “On the Indeterminacy of Equilibrium Exchange Rates”, Quarterly Journal of Economics 96(2): 207-222. Sharpe, W F (1964), “Capital asset prices: A theory of market equilibrium under conditions of risk”, The Journal of Finance 19: 425-442. Lintner, J (1975), "The valuation of risk assets and the selection of risky investments in stock portfolios and capital budgets", Stochastic Optimization Models in Finance: 131-155.